The mounting system of the RR Race Rearsets feature a multi-position Footpeg Mounting Plate which allows the rider to position the foot peg in 6 different locations to find the optimum setting. CRG rearsets feature the highest specific strength and stiffness (high strength & stiffness and low weight) to any rearsets available. Fully CNC milled, GP Style foot pegs, feature an extremely aggressive grip pattern and an undercut design. Oversized, needle bearing pivots in brake and shift pedals for friction free control actuation. 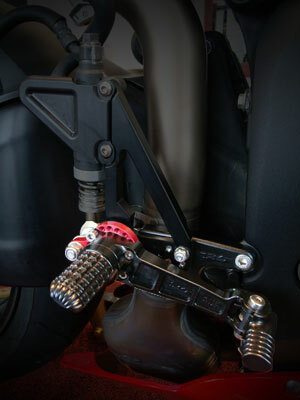 Folding shift and brake tips, rigid foot pegs for damage protection in a tip over condition.